He’s five months old today. My little nugget. FIVE MONTHS OLD. Benjamin Diego is our super-smiley, squawking, babbling, hands-always-in-mouth, almost-sitting-up, Superman-flying little guy. He brings so much joy to our lives and I know I sound like a sap when I talk about him, but I just don’t care. He’s my Benny Boo Bear and I love him to pieces. I can’t believe how grown-up he’s getting. He is a jumperoo fool — you literally cannot stop him. When we say, “Jump, Ben, jump!” he gets this wild look in his eyes and then you pretty much can’t stop him til he’s spitting up his last meal and/or whimpering for a nap (all that exercise!!). This weekend we tried his first solid food: baby oatmeal mixed with a little milk and it was precious watching him attempt to taste it, while the cereal dribbled out of his little mouth. And he’s thisclose to sitting up all by himself. Right now he’s a Weeble … he can sit for like four seconds, but then he’s wobbling and tipping over 😉 (Hence no good photographic evidence). He’s wickedly determined to roll over back to belly but hasn’t done so yet without assistance though he has been doing belly to back since he was 3 weeks old — when he feels like it, that is!). Finally, he starting tucking his chubby nubby knees under yesterday, as though he might push up to a crawling pose … but it only lasts a second or two before his big noggin ends up getting in the way. Such is life as a baby with a giant head. I’ve read a lot lately about “the last” baby and how bittersweet it is, and since Ben is (likely) our last, I’m trying to savor this baby phase with him, the super-fun 4-6 month stage, before a baby is mobile and still content to kick and bat toys on the floor. To enjoy the feeling of being needed constantly (even when it can be a challenge). To enjoy the baby gear all over the place and the fact that leaving the house requires much more foresight than it does with a potty-trained 3-yr old. To enjoy the sweet baby smells — freshly-washed hair, a clean diaper, baby lotion, sweet milky baby breath. And the touches: the softest skin under the sun, plump cheeks to smother in kisses, and roly-poly thighs and arms that can’t be caressed enough. Tiny hands that are damp with drool but haven’t yet been covered in food particles. Teensy piggies that haven’t yet touched dirt, sand, or grass. My best friend always sends me the best articles and this one was no different: it stopped my heart, it was so beautiful. Check it out: “Mommy, Somebody Needs You.” I kind of touched on this notion in this post, but it’s true … there’s something inherently beautiful about being needed. Genuinely needed, where you and only you will do. It’s been an incredible five months and during this time we’ve also witnessed so many positive changes in Maya. I certainly worried about his arrival and how she would handle the massive change in our house with his birth, but she adores her little brother and seeing her love for him — so sweet and innocent — just melts my heart. They say siblings and cousins are our first friends. Since they don’t have any cousins (yet!) I’m grateful they will have each other. 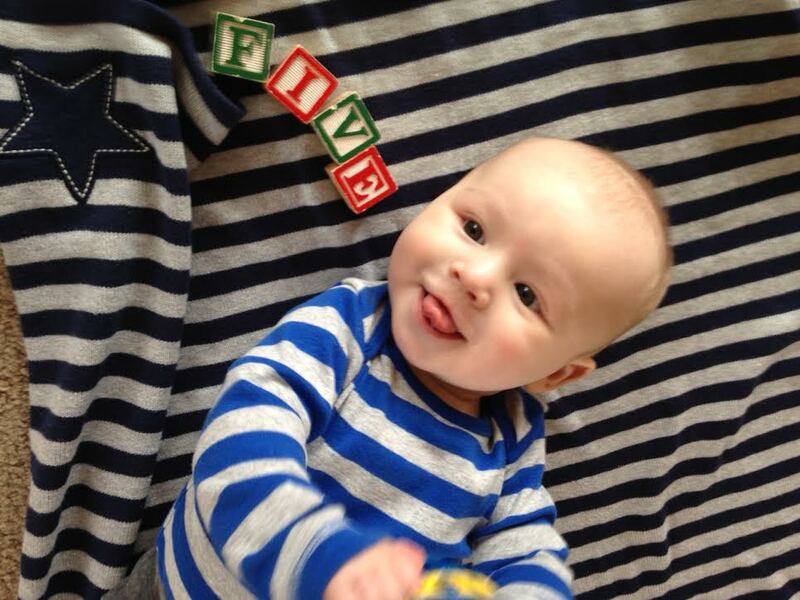 Five months in the books … here’s to the next five, and the next five, and so on and so forth.